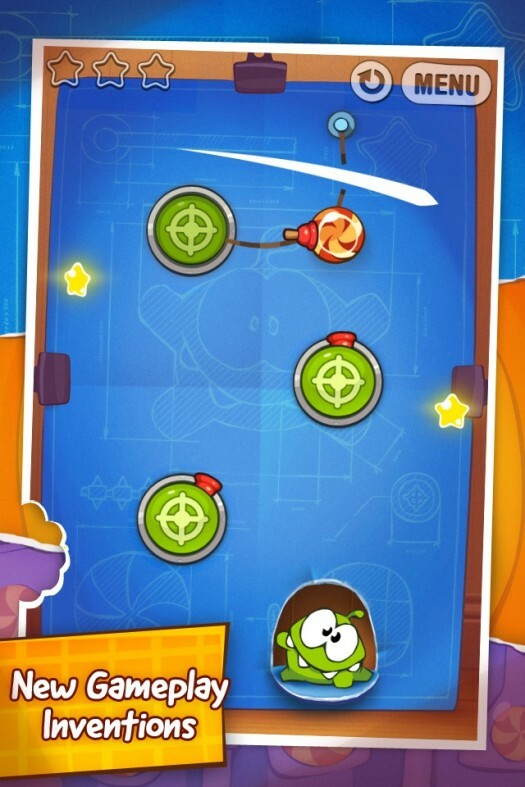 ‘Cut the Rope: Experiments’ Review – Om Nom is Back! It’s hard to believe that Zepto Lab’s classic, Cut the Rope [$0.99/Lite/HD/HD Lite], is less than a year old. In that time it’s inspired a legion of physics-puzzle copycats. It’s also hard to believe that we only learned about Cut the Rope: Experiments [$0.99/HD] two days ago, and now it’s available on the App Store. But hey, it’s a pretty amazing world. If you’ve somehow managed to go this long without trying Cut the Rope, here’s what you need to know: it’s a physics puzzle game, it’s awesome, and you should buy it. It stars an adorable monster named Om Nom, who’s trapped in a series of boxes and needs to be fed candy. You spend your time working your way through the insane contraptions designed to hold the candy back. Our original review has all the details, give or take a few major updates. 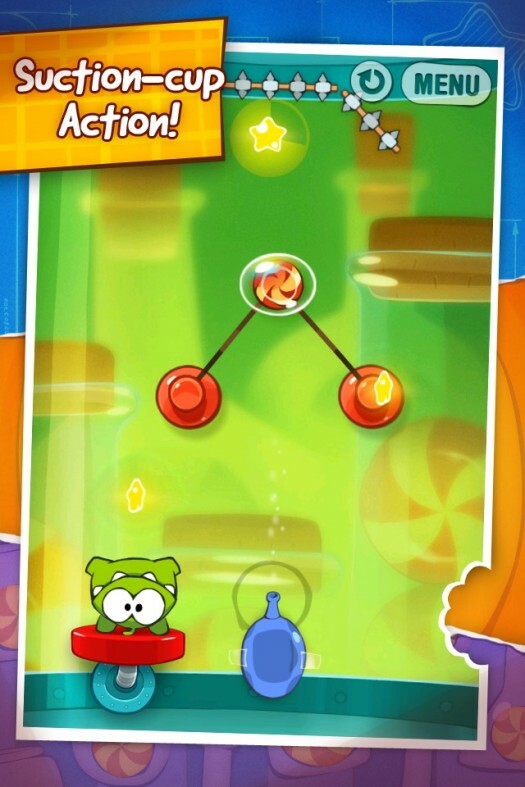 Those details are relevant here, because Cut the Rope: Experiments is very much an expansion of the original game. It introduces no new elements beyond a couple new gadgets. The art is the same, the interface is virtually identical, and the controls haven’t changed. Om Nom didn’t need any work, and he’s still lovable as ever. If it weren’t for the difficulty curve, I wouldn’t have been surprised to see these levels pop up as new boxes in the original game. The difficulty curve is decidedly strange this time around. There are 75 levels split up into three sections. The first 25 levels reintroduce players to nearly all the mechanics of the original game. For experienced players, this will be a breeze. But having everything thrown at you over the course of just 25 levels might be alienating to new players. In the other two sections you’re given two new gadgets to play with, and they’re both quite cool. One is a button that shoots a rope at the candy. The rope can snag it in midair, leading to some impressive carnival stunts. The other is a rope on a suction cup that can be attached and detached with a touch. It still obeys the laws of physics, so you need to be quick to reattach it while it’s dropping. Both of the new gadgets give you a bit more freedom to move the candy around the levels, and they’re great fun to play with. But the fun is over much too soon. The new levels won’t pose a serious challenge to players who have already mastered all 8 boxes in the previous games, and there are fewer of them than were included in the original when it launched. Our forum users largely agree that it feels a bit too easy, and a bit too small. I don’t want to complain — after all, Zepto Lab has been incredibly generous with post-release support in the past, and I’m sure Experiments will be no different. I’m just a bit bummed out that there isn’t something newer, shinier or bigger to tell you about here. If you loved Cut the Rope and still want more, you should definitely get Experiments. Along with 75 new levels, you’ll get Game Center achievements and leaderboards (no Crystal support this time around, since Chillingo wasn’t the publisher), unlockable pictures, and a game with lots of room to grow. It’s nice to see Om Nom finally freed from the boxes, and the professor has the potential to add a bit more storyline to the series. But if you’re looking for something that changes up the formula, significantly expands on the original or otherwise feels brand new, you won’t find it here.